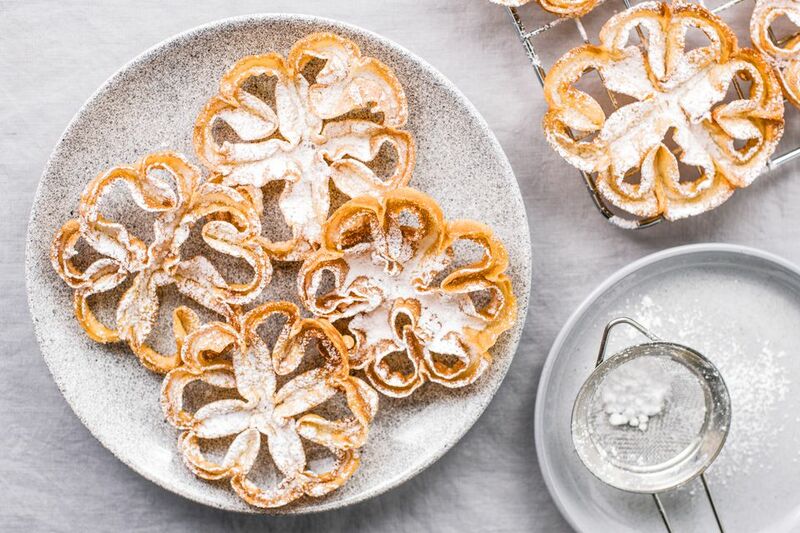 Rosette Cookies, traditional Christmas Cookies, are molded with a special iron, fried to perfection, and sprinkled with powdered sugar. Festive and tasty, these cookies look beautiful on your holiday table. In a large flat-bottomed bowl, beat egg slightly. Add rest of wet ingredients and mix. Measure dry ingredients into a sifter. Sift flour mixture over wet mixture in bowl. Mix with a wire whisk until smooth. Set bowl in refrigerator for 30 minutes. While the batter is in the fridge, set up your work area. In an area near the stove, lay out the newspapers with paper towels, covering them and cooling racks on top of all. Have a plate covered with a paper towel to place hot rosette iron. In a fryer or cast-iron skillet, heat 4-inches deep oil. Place an oil or candy thermometer inside, but not touching the bottom of the pan. Bring oil to 365 F.
Once released, turn over with tongs. Once brown, remove from oil, and cool open-side down on ​the rack over paper towels. Turn rosettes over and sprinkle with powdered sugar.